Are You Résumé Ready? You should be. If tomorrow you hear about a perfect board position, how long will it take you to prepare your materials to apply? You aren’t looking for a job right now. But what if you stumble upon the best next step for your career and the application is due tomorrow? Are you prepared to submit? If you are looking for a new job, is your résumé one of those items on your procrastination list that you don’t have done? These questions are just a few of the reasons you should be résumé ready. Another important reason to have your résumé in tip-top shape at all times is that is improves your self confidence. The practice of reviewing the experience you have gained and the things you have achieved is a great way to tackle pesky cases of imposter syndrome that can affect the way we think about ourselves and our careers. Your general résumé that could be modified for any opportunity is complete and up to date with your current positions and activities. Your résumé has been reviewed by you, and multiple other people, to ensure there are no mistakes, errors, formatting issues, or inconsistencies. It’s ready for prime time. Your LinkedIn profile is consistent with your current résumé and you have taken time to fill out your profile so that it is an accurate summary of your skills, abilities, and future career trajectory. If you are résumé ready and have accomplished the three items outlined above, you are in a far better position to customize an application in a short period of time, apply to serve on a board, or simply throw your hat in the ring for a promotion or position that you discover at the last minute. Being résumé ready is essentially ensuring that you don’t let opportunities go unanswered. Your educational and employment background. Your fit for an organization. Your compatibility for a specific position. In addition to all of that, you are also trying to get past screening reviews (human or technical), and make sure nothing you have in your application documents turns off those who may be reviewing the documents prior to those who are actually making the decisions. Résumés are complex documents with an associated huge responsibility for a page or two of words. This is not something you want to create in a rush, on the fly, or as a “response” to an opportunity. You want to spend time to sculpt the words on the page over time and ensure that your résumé best represents you. 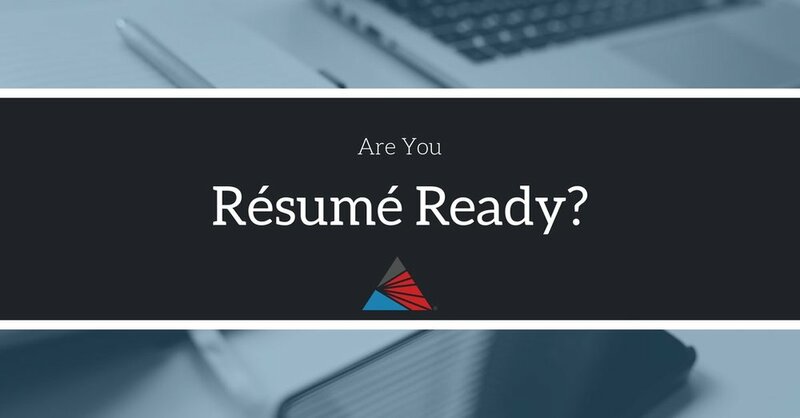 I hope I’ve convinced you that regardless of your current job search status, you should be résumé ready, and more importantly that you quickly work toward becoming résumé ready. Because after you are, I suggest you have a draft template cover letter, reference sheet, and a writing sample that you curate in the same way as your résumé. In effect, the ultimate goal is to be application ready. But that is for another blog post. The key here is, how can you become résumé ready? My first suggestion is to download the free resource, “5 1/2 Ways to Trash Proof Your Résumé,” at www.apochromatik.com/résuméredo. This free resource walks you through simple steps to make sure your résumé is the best reflection of who you are. Second, make sure you have multiple friends, mentors, advisors, etc., review your résumé before you are using it to apply for anything. Listen closely to the feedback. Obviously correct any errors, typos, or formatting. But also listen for their reaction to the document overall. Are they underwhelmed, are they impressed, do they think the document reads well? Does the résumé reflect the story arc of your career and where you are heading? This isn’t to say you have to respond to every reader’s personal taste, but look closely for patterns in the feedback to ensure you have an effective document. Finally, if your résumé isn’t getting the response you want, if you have no idea where to start, or if you simply need some help to get your résumé off the ground and ready, consider a service like Résumé Redo where experienced career coaches advise you on your résumé based on your specific industry. This isn’t the time to hire a graphic designer on fiver.com and hope for the best. Your résumé is the story of your career and can open the door for the next steps, whether service on a non-profit board, an adjunct teaching position, speaking at a professional meeting, or moving to a new role. But to do that , first it has to be ready. Invest in making sure you are résumé ready.